- 1 lb, (ribs favorable) Meat (lamb or goat) Mutton 500gm. - 1 medium, paste Onion Pyaz 60gm. - 2 tbsp, paste Garlic Lahsun 30gm. - 1.5 tbsp, paste Ginger Adrak 20gm. - 2 tbsp, grounded to paste Cashew nut Kaju 40gm. - 4 crushed Cardamom Hari Elaichi 2gm. - 3 crushed Black Cardamom Badi Elaichi 5gm. - 3 tbsp Yogurt Dahi 50gm. - 2 tbsp, (not sweet) Cream Cream 30gm. - 1 tsp Mace Javitri 2gm. - 10 kept whole Whole Red Chili Lal Mirch Akhi 50gm. - 6 slit Green Chili Hari Mirch 50gm. - to taste Salt Namak 20gm. - 1 tsp Sugar Sugar 5gm. - 1/4 tsp Saffron Kesar 0.25gm. - 2 tbsp Milk Milk 30gm. - 1 tsp (optional) Kewra Water Kewra Jal 5gm. - 1/2 cup Clarified Butter Ghee 100gm. 1. 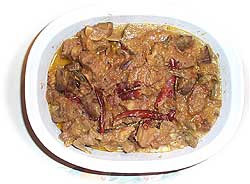 In a large bowl mix the meat, yogurt, onion, ginger, garlic, cashew paste, green and black cardamoms, mace powder, salt and sugar. Marinade for 1-2 hours. 2. In a cooker heat ghee. Add the meat shaking off the excess marinade into the bowl. Fry in medium heat for 15 minutes. 3. Add all the marinade and whole red chili. Mix and bring it to boil on full heat. 4. Reduce heat to low, cover and cook for 45 to 60 minutes. Make sure not to let the meat stick to the bottom of the cooker by stirring it frequently. 5. Cook till the meat is tender. Add water as required so that the meat does not stick. If needed give 3 to 4 whistles to make the meat tender. Remove pressure. 6. Mix the milk and saffron in a small sauce pan and heat for a minute. Add it to the meat. 7. Add cream and slit green chilies to the meat. Bring it to boil on full heat. Reduce heat and simmer for 15 minutes. 8. Add the Kewra water and simmer for another 10 minutes. Remove from heat and serve with rice, pulao or paratha. i Love chicken substitute, it is healthy as well as tasty that give us taste like chicken.